Learn about good foods vs bad foods, how to make your own healthy treats, healthy weight management, and fun exercises with fur kids. It’s summertime and that means we humans are generally watching what we eat. You should also be watching what your dog eats. Would it surprise you to know that there are some foods, while healthy for us, are unhealthy for your dog? You may think that because you enjoy something that it will be ok for your dog. Some foods are toxic and can even be poisonous to your dog. All dogs have different metabolism rates – the method of breaking food down and turning it into energy. Before you try to feed your bully snacks that aren’t made for dogs, take a look at the following list of foods first. You would be surprised what are good and bad! Apples – While the pulp of the fruit is ok for your dog, the seeds are not. The casing of the seed releases cyanide when it is being digested. The rest of the apple is completely fine and is an excellent source of vitamins A and C and fiber. They are also low in fat and protein. You can even freeze some slices to help cool your dog down this summer. Bananas – They are low in calories, sodium, and cholesterol but high in vitamins and fiber. They are also high in sugar so bananas should only be given as a treat and not a regular staple of their diet. Grapes – No matter the breed or weight of your dog, grapes and raisins are incredibly toxic. In fact, their toxicity level is so high that it can lead to sudden kidney failure. Watermelon – Since it is 92 percent water, it is a great way to keep your bully hydrated this summer. Be sure to remove the rind and seeds to avoid intestinal obstruction. 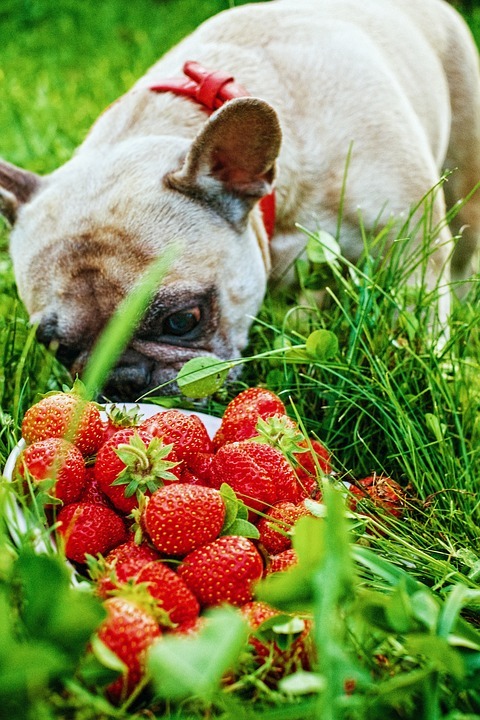 This fruit packed with vitamins A, B-6 and C.
Strawberries – They are full of fiber and vitamin C and they contain an enzyme that helps whiten your dog’s teeth while they are eating it. Give this fruit to your dog in moderation, as they are high is sugar. Pears – These are a great snack for your dog because it contains copper, fiber and vitamins K and C. As with the apple, pear seeds contain cyanide. Make sure to remove the pit and seeds first and cut them into bite-size pieces. Cherries – Do not feed these to your dog. Cherry plants contain cyanide which disrupts the flow of oxygen to your dog’s blood cells. If your dog gets into some cherries, watch for dilated pupils, red gums and difficulty breathing. Get your dog to the vet if these signs are present. They are signs of cyanide poisoning. Carrots – They are great low-calorie snacks that are great for your dog’s teeth. They are also high in beta-carotene which helps produce vitamin A. Tomatoes – It is best to avoid this food altogether. It can be ok for your dog to eat a red tomato but eating a green, or unripe, tomato can get sick from a toxic ingredient called solanine. Avocado – It is an incredibly healthy snack for humans but can be harmful for your bully. The pit, skin, leaves and flesh contain persin that can cause diarrhea and vomiting. Broccoli – In small quantities, broccoli can be safe for your dog as a treat. While high is fiber and vitamin C, it also contains a toxin that can cause gastric irritation. The stalks also can cause bowel obstruction. Celery – This crunchy snack contains vitamins A, B and C. It also has nutrients to help heart health and fight cancer. It also can help freshen up your bully’s doggy breath. Sweet Potatoes – This root vegetable is high in nutrients and vitamins. As with regular potatoes, make sure you wash, peel and cook them without seasoning before you give to your dog. You should avoid sugary sweet potato dishes and casseroles. Green Beans – These are a good choice for your dog that is loaded in iron and vitamins. Fresh green beans or canned with no salt are the ones to give your dog. They are also a low-calorie snack that your dog will love. Rice – Grains like rice are a good thing to feed your dog in moderation. White rice is often recommended to help settle an upset stomach or firm up stools. Brown rice is higher in fiber than white rice and a good source of manganese. It is also rich in antioxidants, helps stabilize blood sugar and helps maintain healthy weight loss. Oats – If eaten plain, oatmeal is a low-calorie food that is high in fiber, protein and is naturally gluten free. It can help reduce the risks of high blood pressure and clogged arteries. It can also help boost your dog’s immune system. Raw Meat – Your dog still has predatory instincts and eating raw meat is one of those instincts. It has valuable protein that is beneficial to your dog. You can feed your bulldog small pieces of uncooked types of beef. If you are serving your dog raw meat treats, stick to quality lamb, beef and turkey. These choice cuts of meat can reduce the risk of parasitic disease and illness. Cooked Meat – Lean ground turkey and chicken is a great meat if you are looking to make your own dog food at home. You can also give your dog cubed or ground beef that is unseasoned. Raw or cooked liver is also a great snack but be careful to limit your dog’s exposure to avoid a toxic buildup of vitamin A. You can also give your dog most cooked fish. Tuna and salmon are great sources of protein and good fatty acids. Eggs – You can feed your dog eggs in any form as long as you limit it to a couple times a week. You can scramble, poach or even hard boil the eggs. It can help build muscle and repair tissue thanks to its level of protein. If you decide to hard boil, you can give the whole egg – shell and all – to your bulldog. Raw eggs should be avoided to avoid excess levels of avidin that can interfere with your dog’s metabolism. Milk – Like many humans, there are dogs that have a problem digesting milk due to the nutrient lactose. It can cause diarrhea, gas and even vomiting. It is easy to determine if your dog has an allergy; loose stools and excessive gas are good indicators of the allergy. Dairy products like cheese and yogurt have less lactose than milk and may be better snacks for your dog. 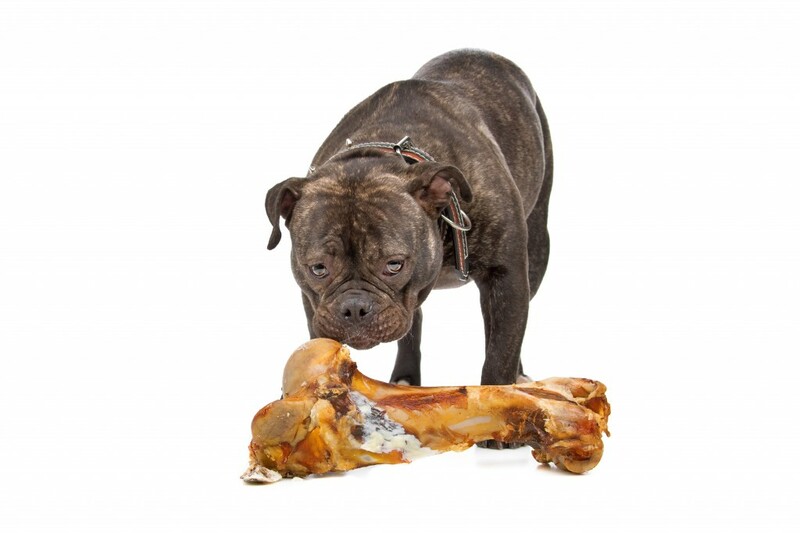 Bones – The general consensus in the veterinary world is that bones, even raw, can severely harm your dog. The bones can splinter and cause dehydration, inability to vomit or pass stool. The nutrients that some say bones provide come from the connective tissue and not the actual bone. The minerals in the bone can also be found in regular food. Rawhides – There are some small risks that come with giving your dog a rawhide. They can be contaminated with trace amounts of toxic chemicals, it can cause digestive irritation, and it can also create a choking hazard. Chewing is a natural instinct for your bulldog and can help reduce anxiety. You might be better to select a good nylabone for strong chewers Keep a constant eye on your dog and you can help keep him happy and healthy. 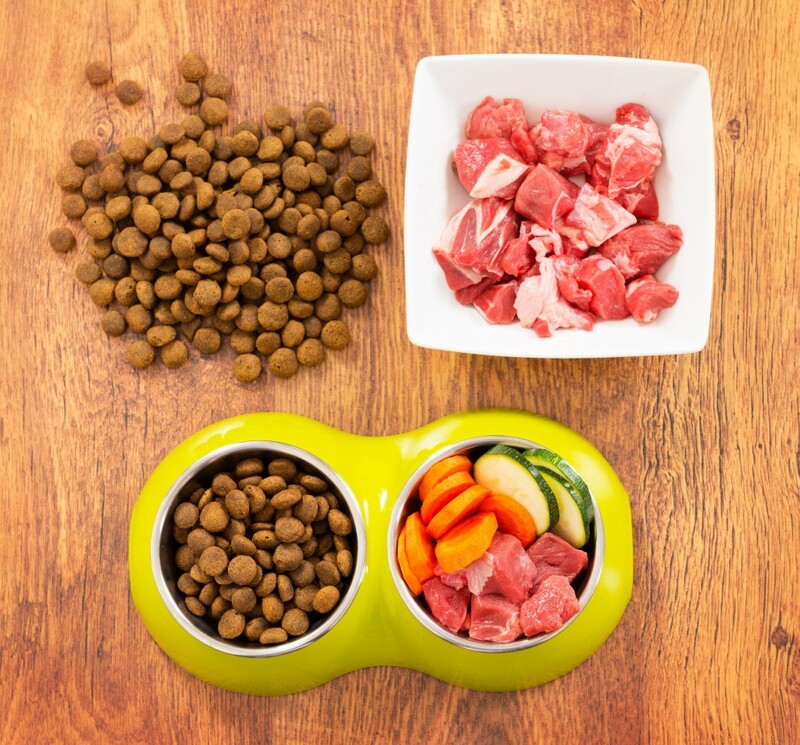 Now that you have a good idea what foods are safe and unsafe for your dog, you may even want to look into creating your own homemade dog food. 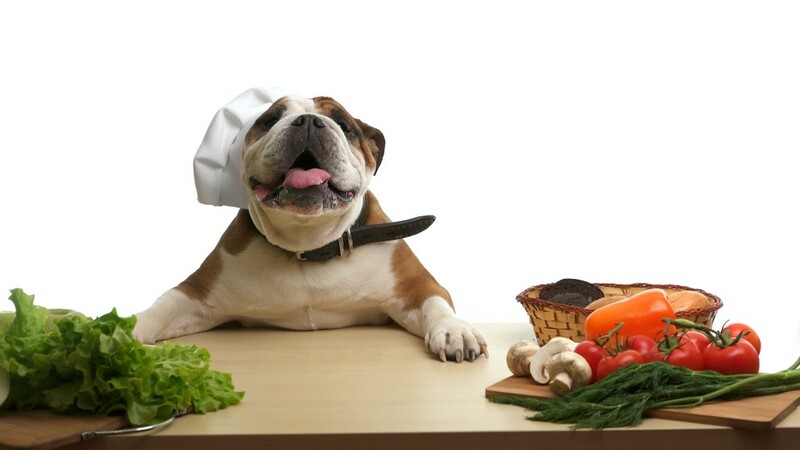 A quick call into your vet can tell you what ratio of meat to vegetables and fruits are good for your bulldog. The key to a healthy diet is always moderation and knowledge. Your bulldog will enjoy these new treats and you will too! In the snack aisle of your local pet store, there are many different snacks to choose from. There are meaty flavored ones. There are crumbly cookies in the shape of bones and even ones to help clean your dog’s teeth. The only problem is these treats can be expensive and may contain ingredients that are less than desirable. Why not make your own at home? You can control what ingredients you use and tailor it to your dog. Any one of the recipes below is sure to please your bully! Let’s face it; Cesar Milan knows his stuff when it comes to dogs. Over on his blog, Cesar’s Way, he gives a list of homemade treats for your dog. One of them is a trail mix using the leftovers you can find in your fridge. You can use whatever meat and veggies you have but make sure you rinse off any seasoning. Dice them into half inch cubes and spray them with a light layer of cooking spray. Then pop them into a 200-degree oven and take them out when they are dry. This snack would be great for those afternoon hikes or after a short walk. The protein will help your dog’s muscles while the veggies are low in calories. You can also mix in some fruit but make sure that it isn’t toxic for your bulldog. Just like most dog owners, you have a box of dog biscuits waiting in the pantry. You grab a couple when you are training your bulldog and give him one when he did something good. Wouldn’t you like to make your own? 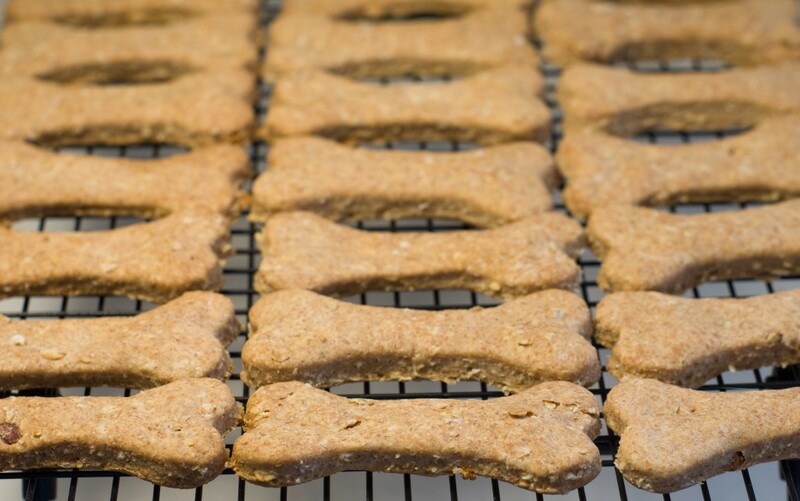 The wonderful chefs over at myrecipes.com have a delicious recipe for dog biscuits. With ingredients like whole wheat flour, wheat germ and brewer’s yeast, you are ensuring that there is only good grains in your dog’s treat. Chunky peanut butter is a great source of protein and healthy fats. It also has vitamins B and E and niacin. An egg is another good source of protein and low sodium chicken broth will add a good flavor. You first need to mix the wet ingredients in a small bowl. Then mix the dry ingredients in a separate bowl. Combine the wet with the dry and mix until you have a rough dough. Knead the dough a few times to bring it all together. Roll it out then use a bone shaped cookie cutter to cut out the treats. Cook on a parchment lined cookie sheet in the oven for about a half hour. Let the cookies cool completely to ensure they harden. Keep the two dozen treats in an airtight container and you can feed them to your bulldog for days to come. Who says cake is only for humans? 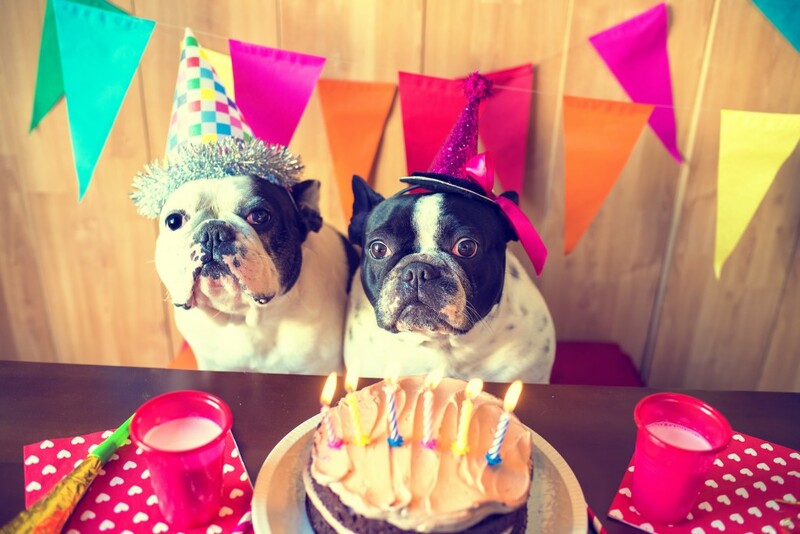 This year you can make your bully a special cake to celebrate his/her birthday or his/her adoption day. The chefs at food.com have a simple carrot cake recipe with ingredients you already have in your pantry. You’ll need to mix an egg, peanut butter, honey, vanilla and carrots together. The recipe calls for cooking oil but you can substitute applesauce to make it healthier for your dog. Then stir whole wheat flour and baking soda together. Then, combine the wet ingredients with the dry. The recipe says to use a ring, or bundt mold, but a regular loaf pan would be just fine. Once your oven is hot enough, you need to cook the cake for about 40 minutes. Then cool completely before frosting with a dog safe frosting and decorations. 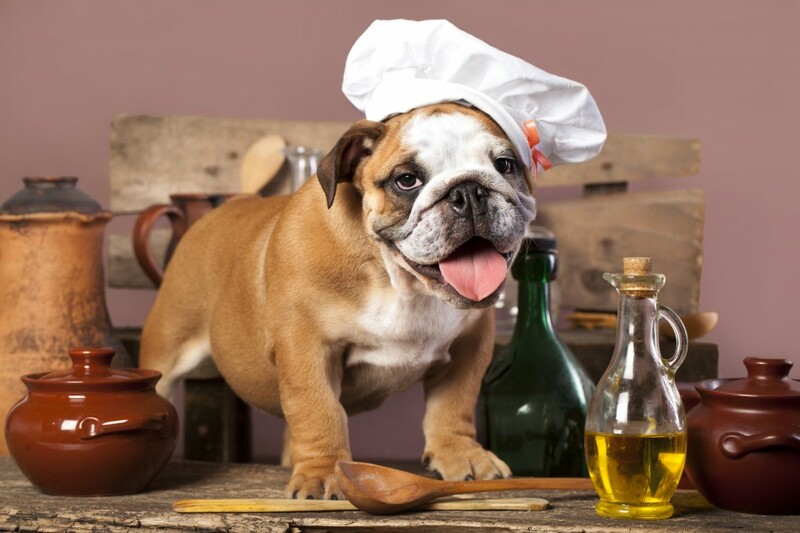 With safe ingredients, you can make homemade treats for your dog. It allows you to control what they eat and make sure they are getting all the nutrients and vitamins they need. These snacks are great for grabbing on the go or celebrating your bully’s special day. We all have to eat. Our dogs are no different. Bulldogs need a diet that helps them maintain a healthy weight. Overweight dogs have more stress on their joints and organs. They also will suffer from lower energy levels if they are carrying around a few extra pounds. If you are wondering about your dog’s weight, here are some ways to ease your concern. 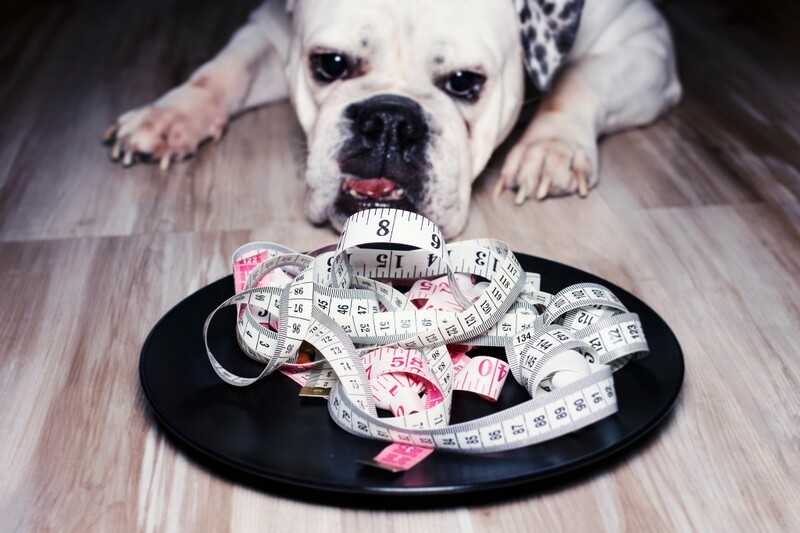 While some dogs are overweight due to physiological problems, there are some common causes. Lack of exercise is one of the most common reasons for those extra bully pounds. We as humans are affected by this reason also. If you work all day, then your dog is most likely kept inside. They aren’t getting the needed exercise. By taking scheduled walks every day, you can keep your dog active. The second most common reason is overeating. You may feel that giving your dog constant access to food is a good thing for them. It isn’t. 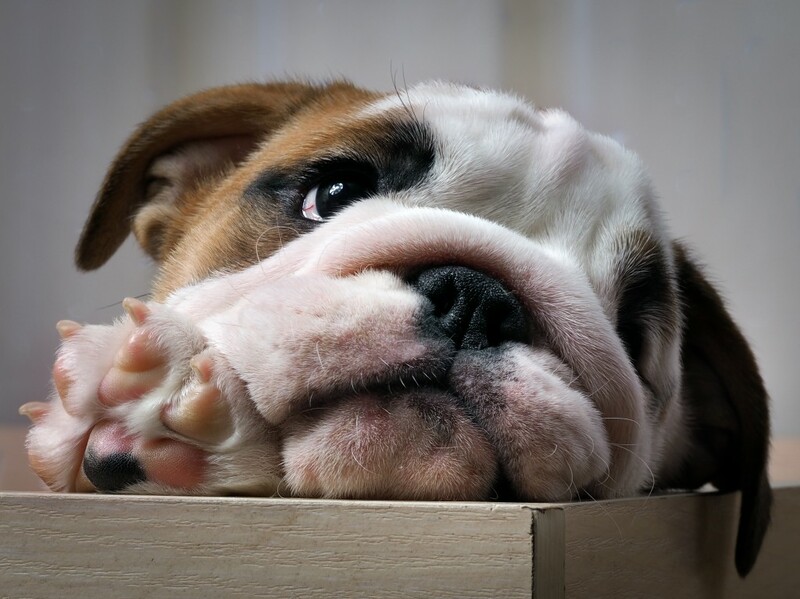 You don’t need to feed your bulldog huge amounts of food or lots of snacks throughout the day, even if they give you the “puppy dog eyes”. As natural born scavengers, they learn quickly that a certain look will produce food. Keep your bulldog on a feeding schedule recommended by your vet. There are other reasons beyond food and exercise that could cause your bully to gain weight. In some cases, a dog’s metabolism can become lower if they are spayed or neutered. This is extremely rare, however, according to the people over at dogtime.com. There are also hormonal disorders and a naturally slowing metabolism that can cause your bully to gain weight. One of the most effective ways to track your dog’s weight is to take them to regular vet checks. Your vet will weigh your dog and chart its growth and weight gain. They will also be able to help you set up a feeding schedule with the correct amount of food per feeding. 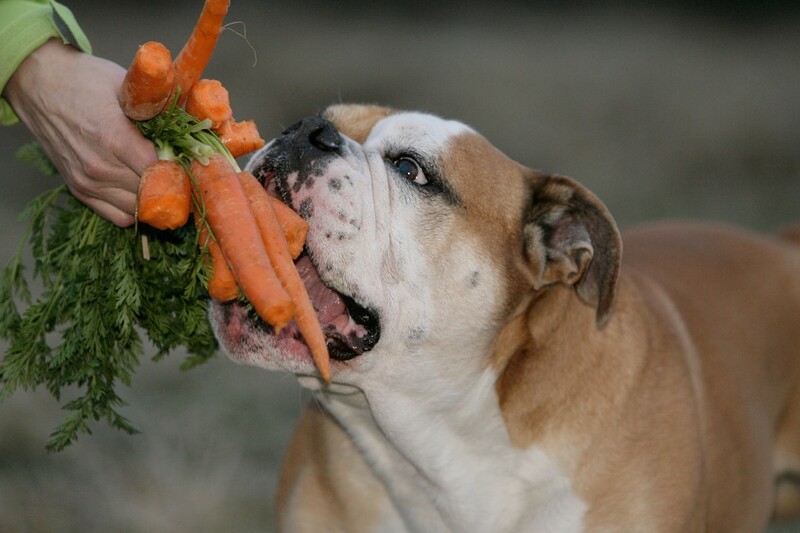 Check out this article for a comprehensive list of foods your bulldog can and cannot eat. Another easy way is to feel your dog’s ribs and spine. With your hand and gentle pressure, feel your dog’s rib cage. There should be a thin layer of fat between the skin and the bones. If there is a thick layer, your dog may be overweight. Your dog may be obese if you cannot feel their spine or ribs at all. Look down at your dog’s silhouette. You should be able to tell where his ribs and hips are. The abdominal tuck – the area behind the ribs – needs to be smaller than your dog’s chest. Bulldogs are deep chested so the difference will be great. If your dog’s breathing becomes more difficult after a little effort, there could be a problem also. If you have an overweight bully, you can help get him back to a healthy size. Consult with your vet and make an appointment. They will do blood tests as part of the physical for your dog. The vet will also ask about your bully’s eating habits. 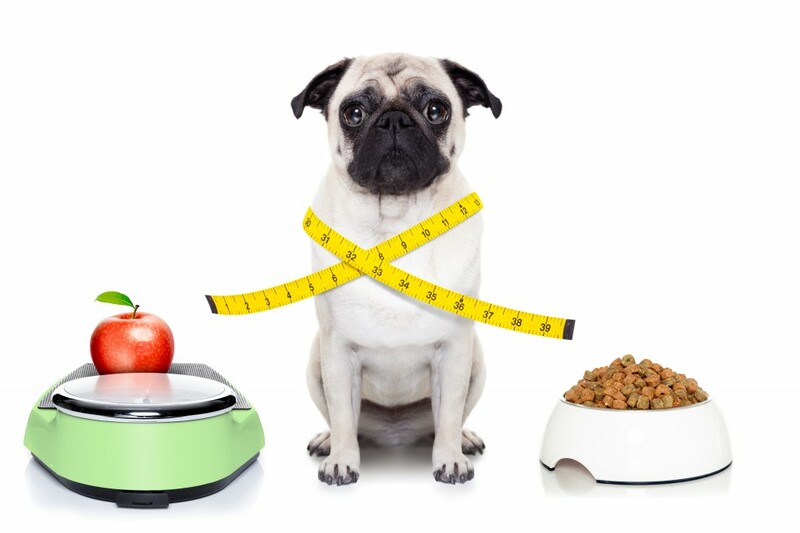 Once they have received all the information they need, they will help you start your dog’s weight loss plan. They will most likely give you a list of dog foods that are lower in calories. You will also be instructed to give your dog more fiber and water. You will also be given examples of exercise for your dog. Your veterinarian may ask you to keep track of what your dog eats. You will need to be able to observe your dog’s progress by keeping a log of what your dog eats, how much and how often. You may find yourself becoming obsessed and even measuring out an exact amount of food. Whether it’s only a few pounds or more, your bulldog can lose the weight. It will be a slow process. Some dogs may take up to a year to lose the weight so stay patient. This is all to keep your bulldog around a lot longer. By following a strict diet and increasing the exercise, your bulldog will be fit in no time! You have decided that your bulldog’s weight may be a little heavier than it should. You made some healthy snacks for your bulldog to help him lose the weight. You are keeping track of what your bulldog eats. Now, you want to get your bulldog on an exercise system. Here are some fun exercises to help get your dog back on track to a healthy life. If you personally have limited mobility, a game of hide and seek is the perfect way to exercise your dog. Enlist a friend or member of your family to help with this game. Your dog will need to know the stay command or it will not be a fun game for either of you. Have your helper go hide in a place that is somewhat easy to find the first time. When they say they are ready, release your dog to go find his “reward”. When your bulldog finds your helper, have them reward your dog with a healthy treat. As you continue to play this game, you can make it more difficult for you dog to find you. Add more obstacles and challenges to the game to make your dog work. You can also extend the amount of time your bully has to wait to find your helper. Most people will agree that bulldogs don’t swim; they sink. 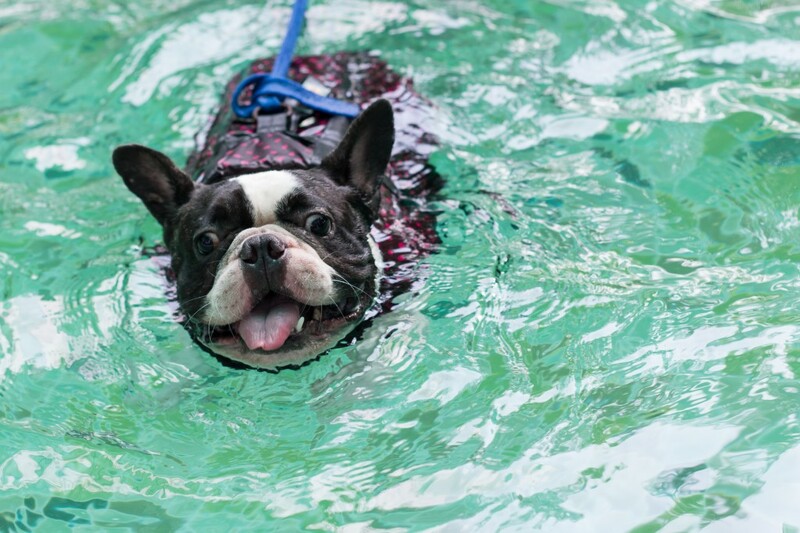 Your dog can learn to swim and can have great success. You will need a lifesaver to help keep him buoyant and he has to be within reach. The water will help older dogs with joint pain. The water will take the weight off the joints so your dog can move easily. All you need is 10-15 minutes in the pool and your dog will be well on his way to a healthy weight in no time. Bulldogs are not built for agility courses. 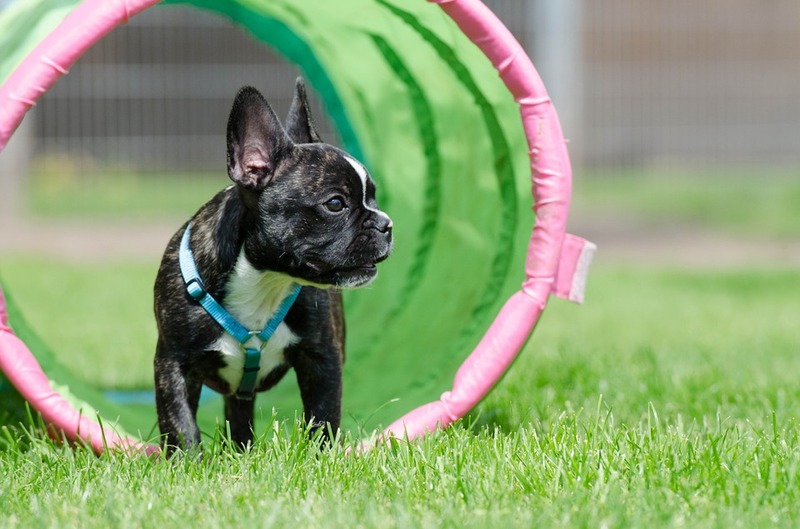 You can build a course that is a little easier for your bulldog to complete. By using PVC pipes, you can make a jump that is the perfect height for your bully. Just make sure that the bar can be knocked off to keep your dog safe. Tunnels are great obstacles for your dog. Be mindful that the first few times can be scary for your dog because it is a dark and enclosed space. It needs to be wide enough for your dog to pass through and sturdy enough that your dog will not tear it up. You can find an inexpensive dog’s tunnel at many toy stores and even online. PVC pipes make great weave poles too. Soccer cones are also great items to use if you don’t want poles sticking up all over your yard. Make sure your dog has enough room between poles and on each end so your bulldog cannot hurt himself. It should be far enough away from other obstacles in the course and things like the fence and patio. You want the best for your bulldog. That is why you feed him the best and healthiest foods and treats. You track how much food he eats and made an effort to cut out calories. You buy him the best toys. Exercise should also be a top priority when it comes to your bully. With these fun exercises, your bully will be back in shape before you know it!